This year there were 10 recipients of the Richard Holland Future Scientist Award. Ten undergraduate students from seven Nebraska colleges and universities recently received the 2016 Richard Holland Future Scientist Award from the Nebraska Coalition for Lifesaving Cures. 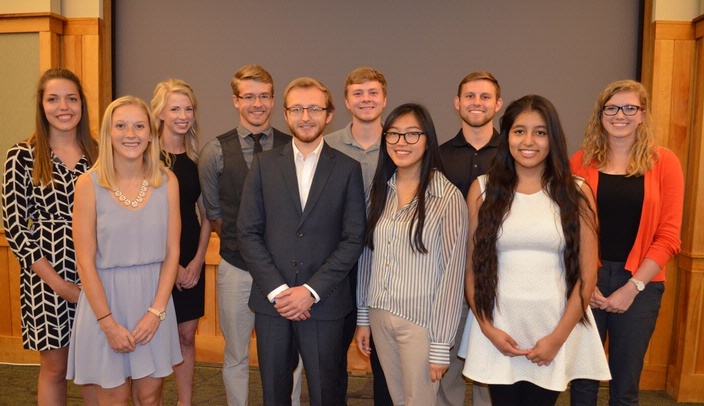 The students received cash prizes totaling $5,000 at the annual INBRE (Institutional Development Award (IDeA) Networks of Biomedical Research Excellence Program) conference on Aug. 9 in Nebraska City. The awards are named in honor of the late Richard Holland, an Omaha philanthropist and longtime supporter of research. Holland died Aug. 9 at the age of 95. This is the ninth year the Holland Future Scientist Awards have been awarded. The students were judged for their oral and poster presentations of the research work they conducted this summer as part of the INBRE program. The INBRE program is overseen by James Turpen, Ph.D., associate vice chancellor for academic affairs at the University of Nebraska Medical Center. Dr. Turpen is a professor in the UNMC Department of Genetics, Cell Biology and Anatomy and is the principal investigator of the $16.2 million grant funded by the National Institute of General Medical Sciences of the National Institutes of Health that funds the program. Established in 2001, the INBRE Scholars program was created to expose students to serious biomedical research and build a statewide biomedical research infrastructure between undergraduate and graduate institutions. The students, referred to as INBRE scholars, enter the program after completing their sophomore year of college upon recommendation of their college professors.